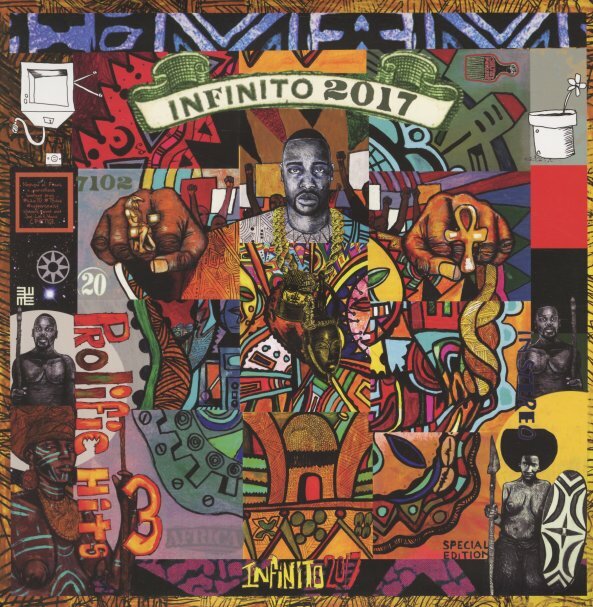 A concise and crucial compilation of standout tracks by the tireless Infinito 2017 – the Chicago-born underground hip hop phenom who's been prolific and on target for a solid couple of decades! Infinito rhymes and records as he lives and breathes, hundreds of tracks over the years, and honestly, every single record we've picked up by him has timeless gritty gold. Can't imagine what it's like for him to go through the catalog and pick out just a dozen tracks for posterity, but this is all fire. Features production by Memo, Dion Brown, Mr. Mind, 950 King and others, and titles include "Protect-In-Contest", "Wake Your Style Up", "Study Guide Pg. 3", "Natural Time", "BETTER", "Harolds Chicken Mystery #7", "Shot Of The Devils At The Minstrel Show", "My Boom Box", "Out With The Old", "Black Is Beautiful (Original Ones)", "Self Contained" and "Never Close". © 1996-2019, Dusty Groove, Inc.